We're devastated to report the tragic passing of beloved Mountaineer Sue Bennett. With great sadness we share the news of the passing of Sue Bennett, a beloved member of The Mountaineers community - a Mountaineer, Bellingham branch member, volunteer leader, and board member. Sue has been a member of our community for 15 years and was a leader in our Bellingham Branch, receiving last year’s Branch Service Award for her leadership and dedication. We talked to Sue in February to share her Mountaineers story with our community. 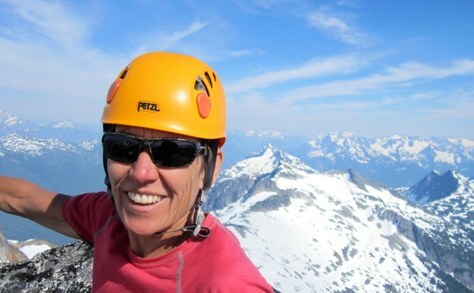 A Pediatric Dental Hygienist, Sue loved "climbing, mountaineering, climbing, hiking, climbing, soccer, and climbing". She is outstanding and a teacher to all and very supportive and understanding of everyones abilities and incorporates this all into her trips. She continues to improve your skills where you are lacking to make you the the best. She provides positive feedback and guidance in all you do. She makes trips fun! She is knowledgeable, fun, and extremely patient with learning and inexperience. Everyone was given the opportunity to participate in decision making, navigation, etc. I very much enjoyed climbing with Sue. Gave us guidance, but at the same time let us have input. Sue Bennett has been a cautious and pragmatic leader. It was a real learning experience to work with her on everything from going over the available beta on the routes, to scoping the route for climbers returning and existing boot track the evening before our climb. She made the trip fun but also was professional and demanding enough to keep us moving, which really paid off in giving us the time to negotiate some tricky rappels toward the end of the day. Just an overall wonderful person to hang out with. She lived for spending time outdoors and found inspiration there. "[I'm inspired by] my love for the mountains and the people who give so much to make our group so fantastic." You can read her full story here. At the time of her death, Sue was outdoors doing what she loved: climbing with fellow Mountaineers. While descending the West Ridge of Forbidden Peak after summiting, Sue fell several hundred feet. A member of the climbing party activated a PLB to initiative an emergency response, but Sue was unable to survive her injuries. North Cascades National Park is coordinating helicopter flights today to recover her body. Our deepest sympathies go out to Sue’s family, the others who experienced the tragedy of this accident, and the Bellingham climbing community. We are all stunned by the loss of such a beloved member of our community. Sue was a close friend and colleague to many of us, and we will be offering support to those impacted as our community comes together process the grief of this traumatic event. Editor's Note (Added July 28, 2017 at 2:20pm): We've been inspired by the amazing support and kind words that have been flowing in about Sue. We wanted to share this blog by a former student and encourage you to share your memories here in the comments section or join the conversation on our Facebook post. We will continue to provide updates about plans for a gathering. My daughter and I were camping in Eldorado Basin Saturday evening for a Sunday climb. Saw what appeared to be a search and rescue helicopter fly directly over us Saturday evening. My hope was that it was some sort of training exercise. So sorry to hear the real reason for the helicopter's presence. What a terrible tragedy. My condolences to those that knew her. As a fledgling climber I hope that more details of the incident will be shared especially since she was a veteran climber.